Why SIP are getting Discontinued? As economic analyst and financial advisor as well as client I find that now day’s products are not miss-sold but the underline concept of investment pitch is not very clearly understood by the financial advisors or IFA. There is thin line of difference between lumsum and SIP and diversification of risk. Selling of financial products is gone now. It’s the time of selling or rather designing the strategy of investment in some place. 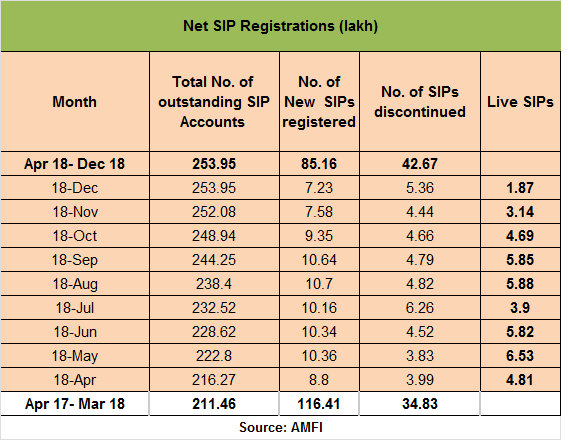 In the month of December 2018, the industry has added just 1.87 lakh net new SIP accounts, shows a recent AMFI report. 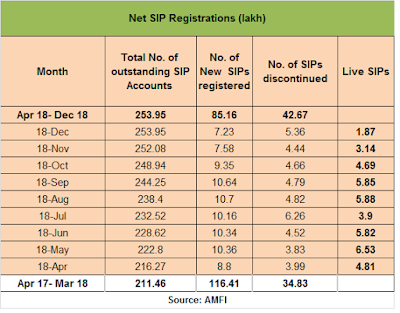 Compared to April 2018, the net SIPs declined by 61% to fall to 1.87 lakh in December 2018 from 4.81 lakh in April 2018. Even if we compare to November, the net SIP registrations fell by 39% in December. The point is we need to know why these situations come up and where the advice of SIP or STP went wrong? One should know that SIP/STP and lumsum has different objective for investments and they both cannot be replaced. Well advisors have done this replacement in 2015-2017 and hence we are now we are burning the finger through SIP cancellation. Now the biggest task for IFA is that he has to now convince the client where the investment strategy did went wrong. The run up of the market in 2017 was not taken properly for advising doing lumsum investments. SIP is not meant for every market and Rebalancing is an art which cannot be ignore. Diversification of assets and risk does not mean every time every investments have to be SIP or STP. Analyzing the financial requirement and objective of investments is the key for financial advisory. Even for a distributor or IFA one needs to know the thin line of difference between the timing of ASIP/STP and Lumsum investments. When markets fall one should do lumsum based on the objective of investments. SIP or STP is for long term game where a specified goal which needs to be achieved in the next 10 or 15 years, SIP plays its game. But where the investment is just for making quick gain and in those markets where we get rally like 2017 one should explain clearly the investor about the risk. Before one jumps into rough SIP one should be clear that only risk diversification of lumsum investment into SIP may not be the sole objective of investment by the client. We hardly ask the question to the client about the objective of investments. We pitch the clients that markets are strong and it has huge growth hence start your investments. The client looks through the market numbers and takes the decision of investing in Equity MF by redeeming his FD investments under the objective of getting 12% return (which is higher than FD rate of interest of (8% to 9%). This simple math’s behind the clients mind instigates him to do investments and the distributors just simply adds a value proposition tip of diversification and gets the investments in STP or SIP format. This is the place where the mistake of investments happens and after 2 or 3 years the client simply stops the investments. Re balancing, well it’s not redemption but a different concept of protecting the gains form one investment and creating wealth for the client. This has not been done in the last couple of years. Ignorance is the mother of all evil. One needs to check in that when a desired objective is achieved one should re-balance the investments. But the mistake while starting the investment was that we were not clear from the client side as well as from our side about the objective of investments. Understanding the purpose of investment saves us from loss of client and his money. The government wants to have two Kids but I am happy with one only. Having two Kids is just like tow EMI of high-value amounts and that too will keep increasing and not a floating rate. Growing up one child is a costly affair. Economist around the world might have been busy with the market and economic research but the cost of growing up a kid is more of economic importance. The child is a commodity. Different countries have different cost of growing up kids. Education has become a business. One child is enough for parents and they don’t dream of having the 2nd one. China is a country where its parents pray to have only one child. In fact, the demand and industry size of contraceptives has grown by leaps and bounds. The rising cost of education, quality of nutritious food, health check and medical treatment cost and having a good career has become a costly affair. This is an organized market where the child is the product and rest all are the by-products. The climate of China forces to have higher medical cost and checkups followed with imported food items since the water of China is also polluted with toxics. Coming to the population front China's population growth slowed in 2018 with 15.23 million live births, a decline of 2 million from the year before, according to the National Bureau of Statistics. According to a 2017 study it has been found that more than 50% of families have no intention of having a second child. Further, 240 million Chinese families are over the age of 60 in 2017. This rate is just going to grow. Until the 1990s, most people in China used public education, which was free or had a minimal cost. Medical cost is a nightmare in China. It has one of the world’s highest corruptions in the medical segment where doctors are bribed for taking care of kids. According to world health organizations,on 60+ aged populations in china will soar to 90% to 240 million by 2020. Parents in china have to face significant problems of raising kids and government support is not enough to feed the little ones. India is no less far from the rising cost of education. Schools don’t teach as much as they have to go to a coaching class where they pay hefty money to get educated. In a research study by the National Sample Survey Office (NSSO) reported that between 2008 and 2014, the average annual private expenditure for general education (primary level to post graduation and above) has shot up by a staggering 175% to Rs6,788 per student. During the same period, the annual cost of professional and technical education has increased by 96% to Rs62,841 per student. Private coaching education industry is one of the most lucrative and never plummeting business models. Private coaching accounted for 15% of the average total expenditure on general education. As many as 35% of students across the country have to undergo for coaching classes in the junior levels and this number increases to 60% during the higher standards. The point is an education for a child is now a commodity and it is high demand and will continue till the end of the civilization. Schools and teachers and coaching centers are all interlinked in this game. Many politicians have also deployed a significant amount of investments in developing the network and making significant revenue from these sources. In another survey, its has been found that Indian parents say they contribute ₹ 3,61,975, on an average, towards higher education. The entire spend is about ₹ 7,77,654 for the university programme, including bills and lifestyle costs. 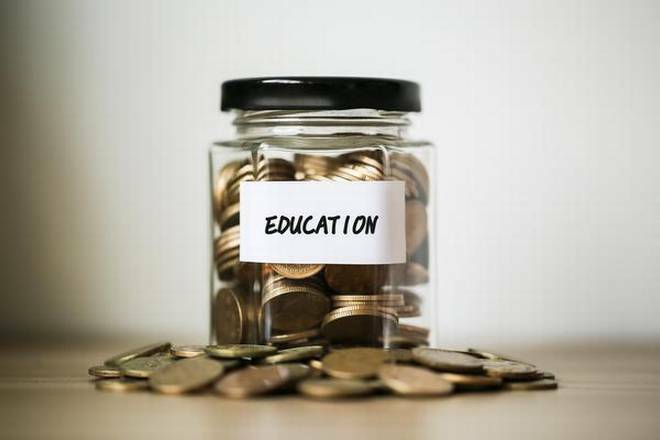 From tuition fees and accommodation to laptops and textbooks, parents’ spending on their children’s university education includes various costs. Of the total funding, 75% goes towards tuition fees. 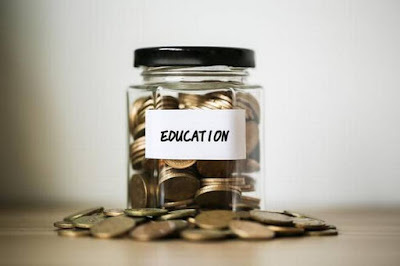 Parents or the child takes education loan which is another by product of education cost.Well, education is a big cost and having two kids is just like having TWO EMI running simultaneously with a long term commitment. BEGINNING OF THE END OF OPEC??? 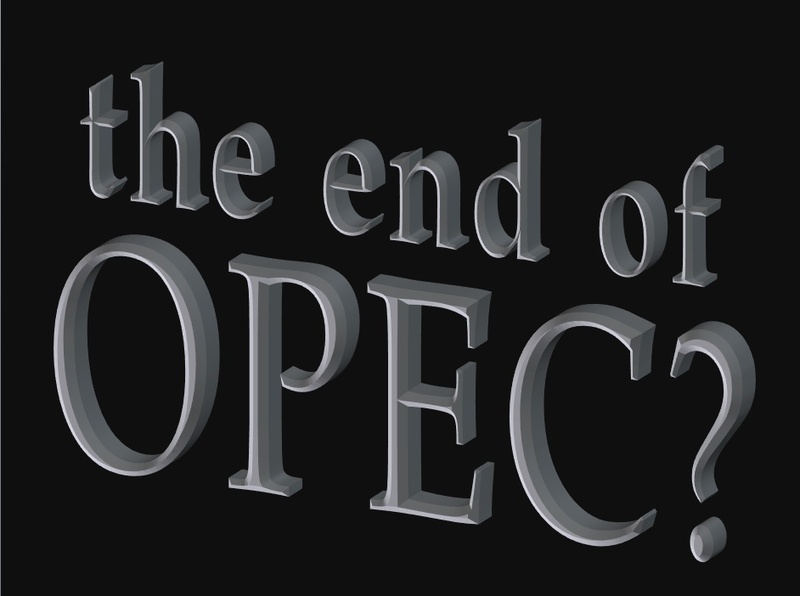 This article is about to showcase the upcoming oil discoveries and the end of the OPEC monopoly. Further, it also going to highlight in the next series that how despite high production profits will be in place despite falling prices(due to excess production by 2022-25). Upcoming crude opportunities will flood the market by 2022-25. One of the promising hotspots for oil and gas exploration drilling this year—South Africa’s offshore. This has achieved significant attraction for investments. Oil companies have found Brulpadda as the prospects off the southern coast of South Africa. The discovery could hold 1 billion barrels of oil equivalent of gas and condensate resources. In another place off the coast of Guyana, Companies had spent decades looking for oil off the coast of Guyana. In 2015 ExxonMobil, the world’s largest publicly traded oil company became the first to find it. The firm now estimates that more than 5bn barrels of oil lie beneath the seabed. If all goes to plan, within the next decade Guyana could become the second-biggest oil producer in Latin America, behind only Brazil. Iran discovers new oil deposits near Abadan city in the Khuzestan province. On the other hand, South Sudan will return to producing more than 350,000 barrels of crude per day by the middle of 2020, up from current levels of just over 140,000 barrels per day (bpd) currently. The legitimate government in Yemen hopes to scale up its crude production to 110,000 barrels per day (bpd) in 2019, with exports touching about 75,000 bpd. The country has proven oil reserves of around 3 billion barrels, according to the US Energy Information Administration (EIA). In another finding, a new assessment by the U.S. Geological Survey (USGS) finds the Permian Basin in western Texas and southeastern New Mexico, already recognized as one of the richest oil and gas regions in the United States, contains even more oil and gas than government and industry experts previously estimated. So taking all these together it can be said that OPEC itself is in big threat once these productions come into play. The monopoly days of OPEC are over. They will have to find alternative revenue sources for their economies since many new nations and places are coming up with crude facilities. The world will be flooded with crude and prices are expected to be on the lower side unless a war situation comes to help the price rise. Those who are betting on prices will rise well it will be for the short term once the demand outlook grows but in the long term excess production will keep prices lower. The new countries where these new productions expectations have come up have welcomed and for these countries, these investments are a great opportunity to develop their economies. Many of the production scale-ups this year in CY-2019 will keep prices lower. Hedge funds have increased their stake of oil prices going up. Now the point which comes up in front of us is that if prices come down then who will invest in these crude discoveries. Well, the global growth of the population and GDP growth in the long term will push demands. Prices will remain volatile but the OPEC control will be negligible and they will have to cut down more in the long term. If US firms Chevron and ExxonMobil, Britain's BP, Anglo-Dutch Royal Dutch Shell and Total of France control the major markets of the crude and they have already made nearly US$80 billion in net profits last year. They have taken up extensive cost cutting and cost measure controls. The capability of reacting to changing market conditions and controlling costs is critical for every oil and gas company. Now more than ever. One of the greatest barriers to accurately capturing cost is the fact that many project-oriented companies are running various applications in different parts of their business. 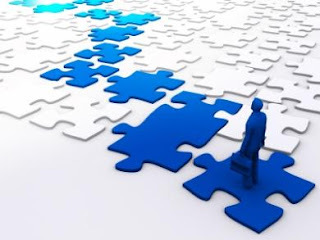 The complexity increases with global operations, as multiple divisions and locations are involved. All these factors affect oil and gas companies and their capability to keep track of planned, committed and actual costs. In my next series I will depict how cost control measures can and is already in place through which profits will continue despite falling crude prices. Labour productivity in India is slow if measured with global players. We are 10-15 per cent lower compared to countries such as Japan, Korea, and the US. Indian manufacturing's contribution to the country's GDP has remained stagnant at about 15-16 per cent for many years. We might copy paste technological advancements from other countries but in terms of human skills, we lack 20 years+. We are in the world of smart sensors, automation devices, new robots, Internet of Things (IoT), cloud computing, location detection technologies, human-machine interfaces, augmented reality, 3D printing, artificial intelligence (AI), big data analytics, and mobile devices, among others. Skill development is the only way to create an economy where one gets an improvement in the quality of labour required to catch the growth of the Industrial Revolution 4.0. Skill development is the key without which no economy can get growth in the long term. We need smart Humans who can adapt and have a flexible mindset with strong technical and sound knowledge about machines and the advancement of technology. But does the Indian skill development syllabus consist of teaching these subjects as mentioned above? The skill development syllabus needs a quantum jump so that industrial 4.0 topics and subjects are being trained at that level. This means that the whole course content needs to be brought down to that level where one can have a deep learning process. Indian economic growth cannot be achieved through a tweaking base and other numbers or weight for the long term. A well-skilled labour force is going to be the key driver of growth in the long term. Skill development should focus on creating a labour force which adapts the new technology and can be ready force of blue colour job. Employment numbers will not grow based on traditional skill development courses. If the industries are heading towards industrial 4.0 then they will need manpower also to manage that revolution. If Indian economy wants a sustainable economic growth based on manufacturing and agricultural growth then without having skilled farmers and labour the same cannot be achieved. It’s not about the GDP growth but about the society and economic development of India. India being a larger population country needs a strong growth model for its people. Skill development will upgrade and will bring income equality within society. States have already been working behind upgrading the syllabus but that may not suffice unless the whole chain of direction from the top is changed towards the future driven. The current course of Skill development is improvised to meet the current requirement with a limited focus on industrial 4.0 revolutions. My whole point of discussion is that by copy-pasting technological advancements an economy can get a quantum jump in technology front but from where it will get the employees matching to run the show. The budget allocation from the government end is highly required and if the centre does not provide state government has to play a stupendous role to meet the industries who are located within their state. Going forward skilled manpower would be the key deciding factor for attracting industries within the states. Those state governments who will have a significant jump in skill development syllabus and having industrial revolution 4.0 in the course will stand to attract huge investments. Corporate India needs a future driven skilled manpower who will match the growth of its GDP with other countries. India has a huge population and significant 3G and 4G internet facility and hence both of them should be placed together to upgrade the skill development syllabus giving output match industrial revolution 4.0. English education needs to be another core part of skill development. Language becomes a barrier and as the new industrial revolution will match the steps of the global economy English needs special attention. Language barriers & grooming need to be enhanced so that the labour is confident to face the outer world. 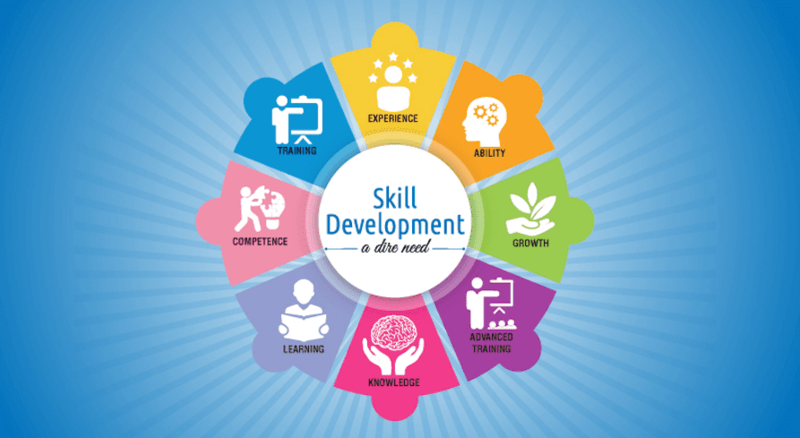 The syllabus needs investments and state government in collaboration with various research institutes can design the platform for the skill development course enhancement. A research institute carries significant edge over the industrial revolution subjects and hence they can create better-skilled labour force. 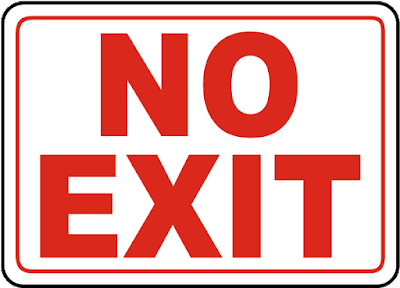 When politics become blind we get Referendum, Austerity and global financial crisis. India is just on the way of making a deep hole in its own pocket. It's not about the election results or who will form the government. These have nothing to do with the current and recent Budget which has been tabled. The revenue projections for FY-20 are just speculation bets and these bets will cost corporate India and the economy in the long run. Political budgets have only created the Global financial crisis type of results which are too big to fail. GDP growth is a far fetched thing to worry about, post budget. I am more worried about from where and on which cost the funds will come for FY-20. My article will give a small picture to the common people where they need to identify the risk and how they should plan their budgets for FY-20. We all should be cautious before betting high. This article is a small step towards the same. The government has set a rather ambitious revenue target for the next fiscal. The total revenue (tax, non-tax and non-debt capital receipts) has been estimated to grow 14.5 %to Rs 19.77 lakh crore from the revised estimate of Rs 17.29 lakh crore for the current year. This includes 15 %growth in tax revenue (Rs 17.05 lakh crore) and 11 %in non-tax revenue (Rs 2.72 lakh crore). The government also expects a 12.5 %rise in income from disinvestments to Rs 90,000 crore. GST rates are coming down from the slab of 285 to 18 to 5% bucket; disinvestments currently are struggling at Rs.36000 cr against the bet of Rs 80000cr and FY-20 have been projected of Rs.90000 which is always dependent on market and valuations. We are betting more consumption and hence we are taking the GST so aggressively. Among all these, if there is less rainfall impacting the crop season then inflation will shoot hence at that time the economy will need more support. From where does that will come, well simply more borrowing. More borrowing means more fiscal impact and vice versa on bonds and currency. Whatever relaxation in various segments have been provided as a source of income for the government hence those leeways will cost the exchequer and hence financing the budget will be difficult. This also projects how much borrowings will stretch beyond the projected number for FY-20. This shortfall will have a much more in-depth impact which is not properly calculated. 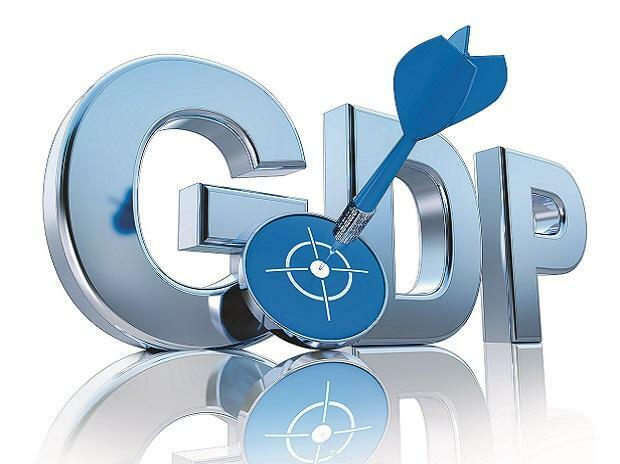 Debt market and bond papers will be under pressure and as government expenditure towards the economy is less for FY-20 I find corporate to tap the bond market and that’s another risky zone. Fiscal deficit related discussion may not be understood by common people but for them, it is important to understand that they will face tough times in the economy. Debt investments should be avoided and Arbitrage funds should be kept in a portfolio. One will witness extensive volatile rides and moreover, interest rates hikes in the coming monetary policy cannot be avoided when a country will have a shortfall in revenue impacting fiscal condition. The currency will be under pressure when revenue shortfall will happen. The borrowing of FY-20 is also very aggressive which already now projects according to me that currency and fiscal will condition will keep under pressure. Gross borrowing in 2019/20 is estimated to grow 33.1 %compared to -9.3 %in the current year. The net market borrowing is estimated to grow 12 %in FY20 compared to a drop of 6.2 %in the current financial year. This quantum jump is enough to create pains for Bondholders, currency and markets. These borrowings will become painful if there are any global crisis or Trade war type threats which will get things difficult for Indian corporate. Interest rates will increase in the due course as the fiscal condition becomes difficult to manage. The recent interest rate cuts down is a significant threat for the economy and the most interesting part will be to watch out how much banks rolls and how much corporate takes it. During these election times, I find it that only a fool will take on the Loan books. The government is betting on the RBI dividend. Well, this dividend can be utilized for the investments within the economy rather filling up the pocket of the government. The government has revised upwards the likely dividends from the RBI by almost Rs 20,000 crore, or 35 percent, to Rs 74,000 crore. If the trade was continues and impacts more than how corporate revenue will increase and how the government will make it's earnings from taxes. Hence government investments will be highly required to save from these tough times. Speculation will not only prepare the recipe for Indian economic problems but also the crude and trade followed with government investments will make the recipe more unique for any government to solve. My Sip is running at loss and I am heading for redemption or stopping it from continuing any further. This is one of the most common things became thought by an investor. Notional loss and over expectation creates the miss-selling concepts in every financial product. 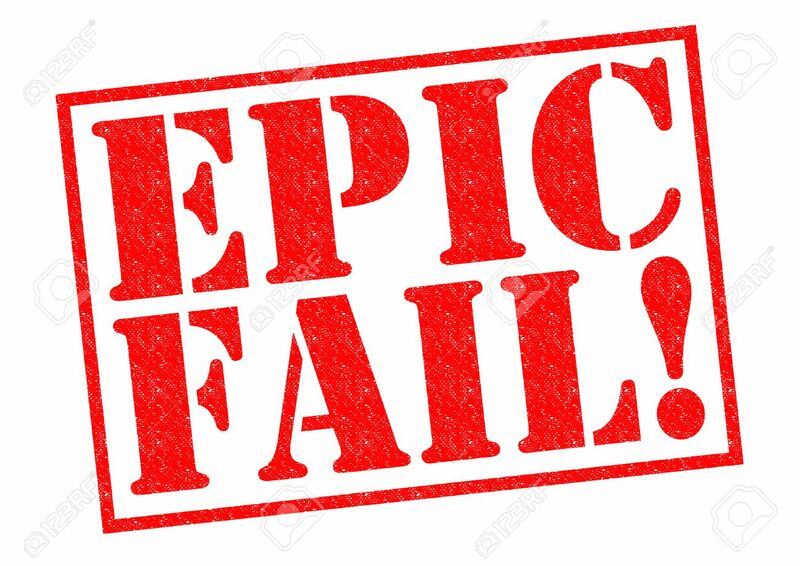 Practically there is no wrong product but there are only wrong words behind pitching the product or explaining the same while the sales are closed. Every investor has just two ambitions and classified under two categories broadly 1) Investor who want something above the Fixed Deposit rate of interest to grow the wealth and 2) those who just invest to make short term gains. I am not going to discuss asset allocation or risk profiling or objective of investments. I am here to enlighten in-depth reason beyond these financial jargons. Every financial advisor is in the race to beat the Fixed Deposit rate of return. Well, one must know and understand that every investment asset class and process has different destinations and not the same one. 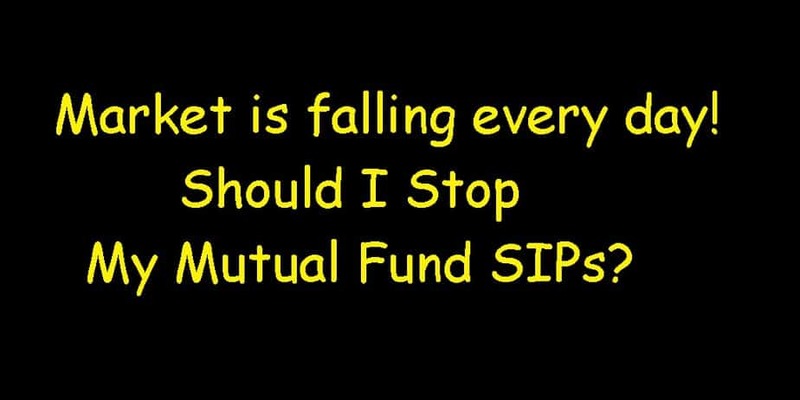 This question of should I continue my SIP rises only when an investment has been made blindly based on short term illusion of gains from the market. Products are never wrong only the presentation and adaptability of the product creates the mis-selling. Rather I would say that wrong understanding about the product leads to the problem where an investor thinks about stopping his SIP. SIP is one of the most efficient ways of creating long term wealth provided proper risk analysis and understanding of the risk was clear to the investor. It’s the responsibility of the investor to think and decide about these two aspects. Post demonetization there has been a stupendous growth in the stock market and hence investments have also increased. 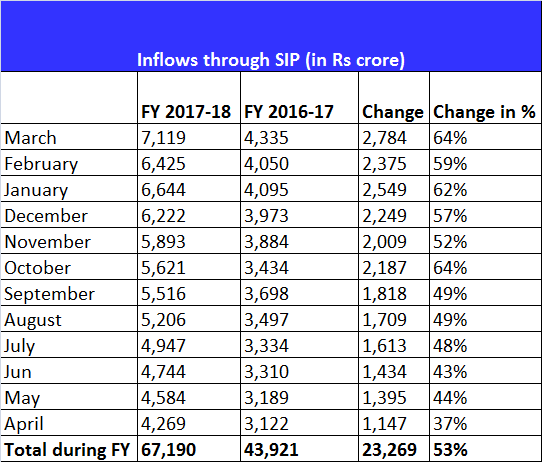 Every investor started doing SIP and increased their SIP inflows. But many of the investors thought or rather understood that through SIP one will make a substantial gain in the short term. The reason for doing SIP was more to make short term profits disguised under the name of doing Lumsum investments and splitting the risk. The euphoria of the market attracts investors to do investments but one must analyze what type of returns one is looking ahead and the broader vision of investing. During 2017-18 the industry mopped up close to Rs.67,190 crore as against Rs.43,921 crore in FY 2016-17 through SIPs, the massive growth of 53%. This 53% jump was based on short term focused return mindset. The monthly inflows in mutual funds through SIPs reached an all-time high at Rs.7,100 crore in March 2018. In April 2017, the industry received Rs.2,784 crore through SIPs. 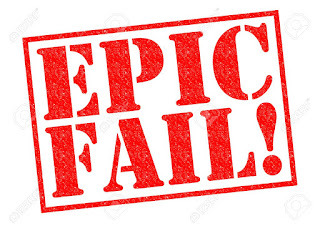 Now when the investor did not get the return as expected from SIP in short term then bell of stopping SIP will ring in his mind. 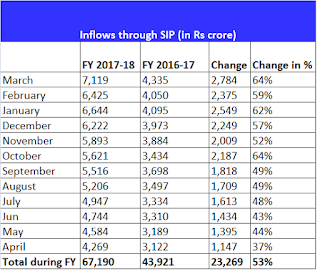 In terms of SIP accounts, the industry had 2.11 crore active SIP accounts in March 2018 compared to 1.35 crore in the corresponding period last year. This significant jump speaks that how many investors came up into investing post demonetization and why an investor today is under dilemma. The main thing which was ignored or did not come out does you really need the SIP and what type of returns you are looking over from the current market levels. If you as an investor have done SIP with the mind of making short term gains then it’s a wrong approach. SIP goes through various phases of the market and then it makes wealth building tool. At the same time re-balancing of SIP, investment is an important aspect. This type of question comes in the mind when an investment has been done with the objective of short term gains and not on the proper analysis of the requirement of investments. 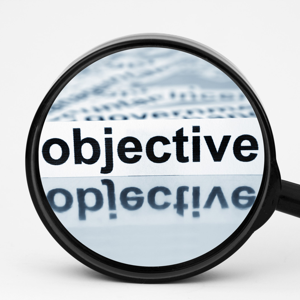 SIP cannot meet all type of investment objective. Yes, the truth is loud and clear. In many places, llump suminvestments over the period of time frame can fetch a good return based on the investment objective. SIP has replaced the Lumsum objective and hence expectation of short term gains from SIP has increased. From 2016 November to February 2018 an investor should have made significant returns on the lump sum investments. Provide the same investments have been redeemed and the profits have been booked. In the same time, an SIP has different investment pattern. · Do I need to start this new SIP? · Does this SIP meet my objective of return in the long term? · Do am I investing based on short term Euphoria? · Can I continue this SIP commitment and for how long? There is saying look before you leap. Look before you commit any investment. Now coming to the conclsuion ,if the SIP commitment seems to be trouble then stop it and take a short term pause. 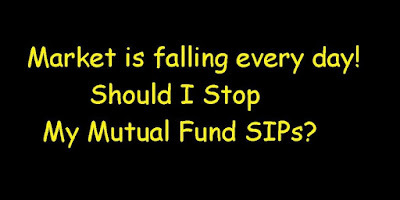 If you are okay with the SIP commitment then continue it with objective.